Turning to the aggregate, whole community level, evidence is largely consistent in supporting the prediction that increased richness in a community increases stability (decreases variability), though a number of studies have failed to detect any consistent relationship (Cottingham et al., 2001; Worm & Duffy, 2003). First, returning to McNaughton's (1978) studies of US and Serengeti grasslands, the effects of perturbations were quite different when viewed in ecosystem (as opposed to population) terms. The addition of fertilizer significantly increased primary productivity in the species-poor field in New York State (+53%), but only slightly and insignificantly changed productivity in the species-rich field (+16%); and grazing in the Serengeti significantly reduced the standing crop biomass in the species-poor grassland (— 69%), but only slightly reduced that of the species-rich field (—11%). Similarly, in Tilman's (1996) Minnesota grasslands, in contrast to the weak negative effect found at the population level, there was a strong positive effect of richness on the stability of community biomass (Figure 20.10b). McGrady-Steed et al. 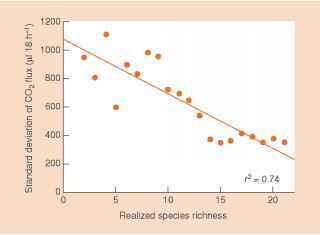 (1997) manipulated richness in aquatic microbial communities (producers, herbivores, bacterivores and predators) and found that variation in another ecosystem measure, carbon dioxide flux (a measure of community respiration) also declined with richness (Figure 20.11). On the other hand, in an experimental study of small grassland communities perturbed by an induced drought, Wardle et al. (2000) found detailed community composition to be a far better predictor of stability than overall richness. Studies of the response of a community to a perturbation (e.g. McNaughton, 1978) or of variations in the community in response to year-to-year variations in the environment (e.g. Tilman, 1996), are focused largely on the resistance of communities to change. A quite different perspective examines the resilience of communities to perturbations in ecosystem characteristics such as the energy or nutrient levels contained within them. 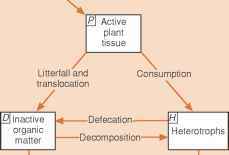 O'Neill (1976), for example, considered the community as a three-compartment system consisting of active plant tissue (P), heterotrophic organisms (H) and inactive dead organic matter (D). The rate of change in the standing crop in these compartments depends on transfers of energy between them (Figure 20.12a). 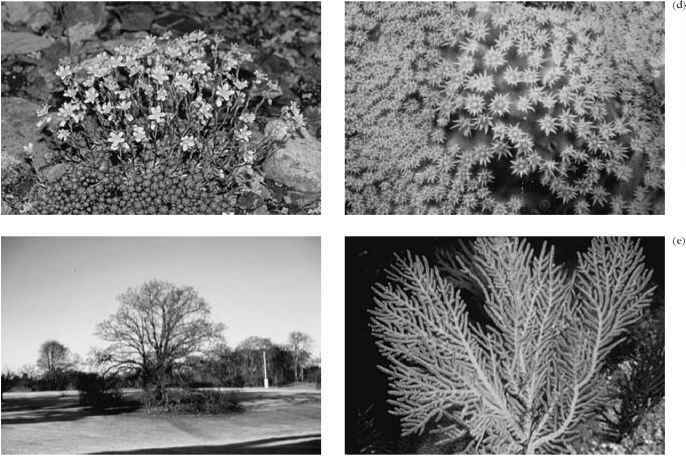 Inserting real data from six communities representing tundra, tropical forest, temperate deciduous forest, a salt marsh, a freshwater spring and a pond, O'Neill subjected the models of these communities to a standard perturbation: a 10% decrease in the initial standing crop of active plant tissue. He then monitored the rates of recovery towards equilibrium, and plotted these as a function of the energy input per unit standing crop of living tissue (Figure 20.12b). cycling rather than energy flow. Here too, then, stability seems more influenced by the nature of the species in the community than by simple measures such as overall richness.